I have been training at the YMAA School in Boston, Mass. for Kung Fu for over seven years. I am 13 years old. I am currently in the third of ten ranks in the adult Shaolin class, meaning I have three stripes. I still remember the first class that I attended when I was only 6 years old. I have been training in Kung Fu at Yang's Martial Arts Association in Boston, Mass. for over seven years. I am 13 years old. I am currently in the third of ten ranks in the adult Shaolin class, meaning I have three stripes. I still remember the first class that I attended when I was only 6 years old. As I stepped into the training studio, I felt nervous and then excited when the class finally started. The three children's instructors, Ben Warner, Jim Noble, and Hussein Alhadi, were all very kind. I fondly remember how they gave me a positive comment about my Wai Bai (External Sweep Kick.) The main event that stood out for me was a class activity where two students would compete in trying to move around and force each other out-of-bounds of a matted area. When it was my turn, I was up against the highest ranking student there, Steven Vo. I was so nervous until Jim Noble came out of nowhere to jokingly push Steven Vo out-of-bounds, winning the match for me! At that exact moment, I knew that the school was a caring environment, and that is the reason I ultimately made the decision to join the school. Little did I know that the decision I made then would impact the rest of my life. Kung Fu has changed my life in many positive ways, not only physically in terms of becoming more athletic, but also very much mentally. All of the ten martial moralities (humility, righteousness, respect, trust, loyalty, will, endurance, perseverance, patience, and courage) have changed me as a person and helped to shape my lifestyle. The most prominent morality that has influenced me is humility. The constant lessons on humility inspired me to be very humble in my everyday actions. Instead of showing off my skills, I learned to respect others and what they know. I always hope that others can teach me something that they are good at. Other martial moralities I like to live by are endurance, will, and perseverance. These three interconnected moralities describe me well as a Kung Fu student. Over the many years I have been training, I have seen many people come and go. After seeing many of them go, I realized that the students that stuck around, like me, have an enormous amount of determination. I found that I could apply this determination not only in Kung Fu, but also to my academics in school. One of the habits I built up from training in Kung Fu is responsibility. I always work on my homework first until it is completed to my high standards before doing other things I want to do. Kung Fu has also helped me physically. When I first started training at 6 years old, I was pretty fat from not doing any sports. I did begin to lose a bit of weight as the years passed, but it wasn't until one Saturday that I discovered a huge store of energy within me. That day, the usual Saturday instructor, Simon Pang, was absent so Elias Kopsiaftis was his substitute. We took turns doing forms, and Elias Kopsiaftis did his forms with such power that I felt inspired to copy him. I closed my eyes and focused. When I did my form, Yi Lu Mai Fu (First Way of Ambush), I was able to generate power from my body that I never felt before. Throughout the years, I have been able to increase this power. After I was able to perform at this much more intense level, I burned off so much fat. Now I am thinner and better built. My new athleticism not only helped me in Kung Fu, but in school as well. In gym, I am currently the fastest sprinter in my class and undefeated in wrestling. One of the huge reasons I am still training at YMAA is because of the instructors. All of the instructors at YMAA helped me get to where I am now. But two instructors, Ben Warner and Jim Noble, have helped me throughout the entire journey. They were with me all the way from the children's class to where I am today in the adult Shaolin class. When I was older, they invited me to assist teaching the children's class. Through this experience, Ben Warner and Jim Noble have helped me push my limits, particularly in developing the courage to teach and to be more assertive when I speak. Through these challenges, I was pushed past my comfort zone, but it ultimately helped my courage skyrocket. In addition to teaching, I have participated in three YMAA exhibitions, public demos where I was able to perform Kung Fu in front of large crowds. I am already lined up to perform in demos for this upcoming year 2010. All of these performances have helped me decrease my stage fright. For the purpose of performing in these demos, Nicholas Yang taught me a sequence, 18 Kicks, that is only known by the two of us at the school right now. This form, 18 Kicks, was originally created by Dr. Yang, Jwing-Ming for one of his senior students, Jeff Bolt. I am so happy that I got myself a signature sequence at the age of twelve. 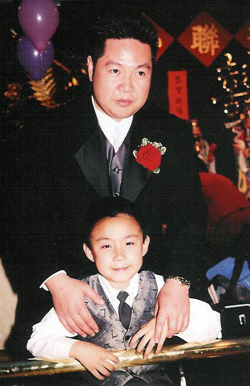 Alec Chan and his father. I continue to train and teach at the YMAA headquarters branch in Boston. I look forward to coming to class every Monday, Wednesday, and Saturday. I have made many friends and have met many people through YMAA. I love how everyone respects one another. I am surprised that children as well as adults look up to me as a role model. They motivate me to want to go to every class. I feel that YMAA is a place where I am very comfortable and can let off some of the stress from school. Though my life journey has had lots of ups and downs, Kung Fu has always been there and I know that it will be there forever. I would like to also commend my dad. My dad is the person that has driven me to every Kung Fu class and still does to this very day. He is also the one that forced me to do the trial week when I was six years old, and it was because of him that I really gave Kung Fu a try. If it wasn't for my dad, I would not be where I am today. Thanks, Dad. It's a coincidence that in my English class at school, I had to write a memoir about a life-changing experience as one of my homework assignments. I am happy to say that I chose my first day of Kung Fu as my topic. I passed in my final essay today, and I am able to echo many of the thoughts and feelings that I wrote about in my essay in this article now. Alec Chan is student and Assistant Instructor at the YMAA Boston headquarters school. He is a featured performer on the Kung Fu for Kids DVD.